(1) In March 2013, we again had record traffic, with 373,735 visits (9,305,497 "hits"). Thanks for your support! (2) Our Feature Page for April highlights Laboratory Accreditation / Education / CME, and includes ARUP-Scientific Resource for Research and Education and Boardvitals Review for Clinical Pathology. We also have a new Mystery Case on the right side of the Home Page. (3) We have a new Cytopathology chapter with an Ultrasound-Guided Fine-Needle Aspiration (USFNA) section written by Joe D. Jakowski M.D. and Susan Meanor R.D.M.S., R.T. We have also updated the Leukemia - Acute chapter based on reviews by Daniela Mihova, M.D. and Syed Zaidi, M.D. 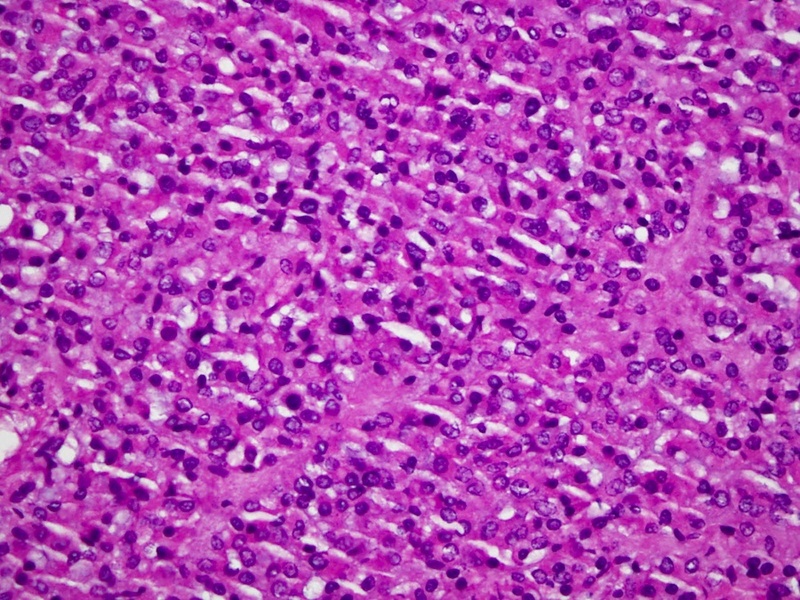 (4) Looking for AFIP fascicles (4th series, Tumor or Non tumor)? 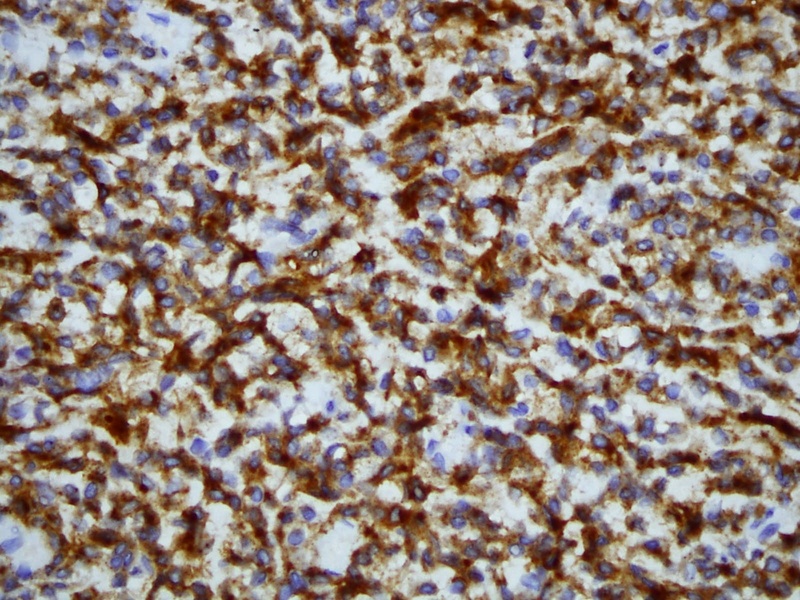 PathologyOutlines.com is doing some spring cleaning and selling many volumes through Amazon.com, mostly in perfect or near perfect condition. Click here to see what is available. 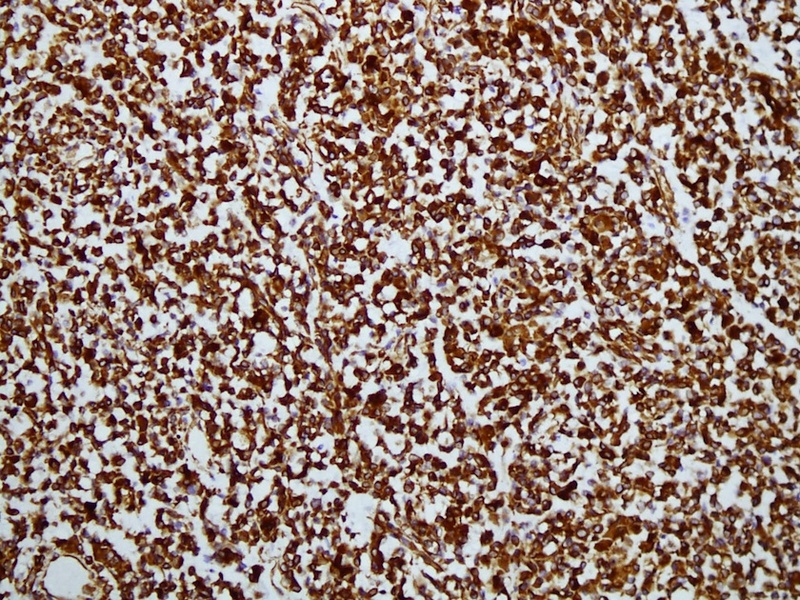 A 65 year old man presented with multiple intestinal and mesenteric nodules. A nodule was excised and submitted in multiple pieces. Gastrointestinal stromal tumors (GISTs) differentiate along lines of the interstitial cell of Cajal, the gut�s pacemaker cell. Behavior varies by site. In the small bowel, 30-50% of tumors have malignant behavior. The median patient age for small bowel GIST is 67 years, and patients often present with large, bulky masses that may be well circumscribed. 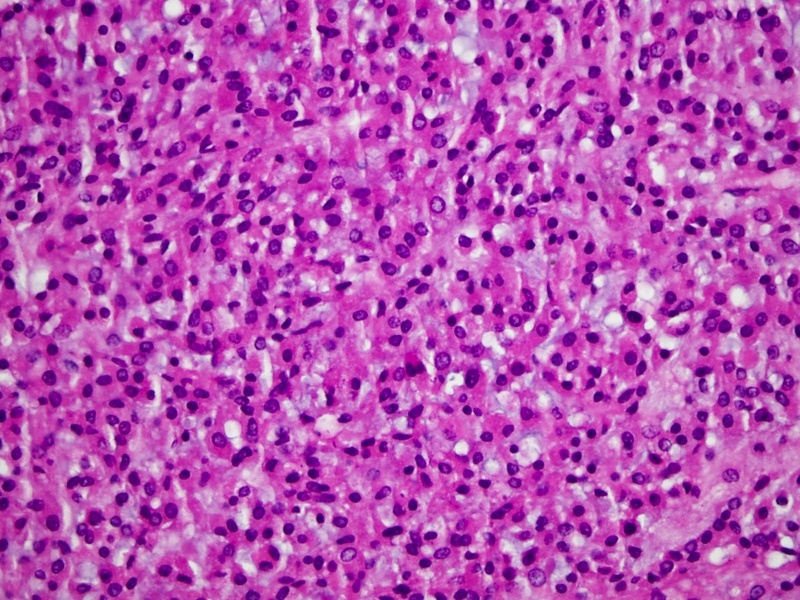 Most (70%) tumors have the classic spindle cell pattern, but 20% are epithelioid and 10% are mixed. 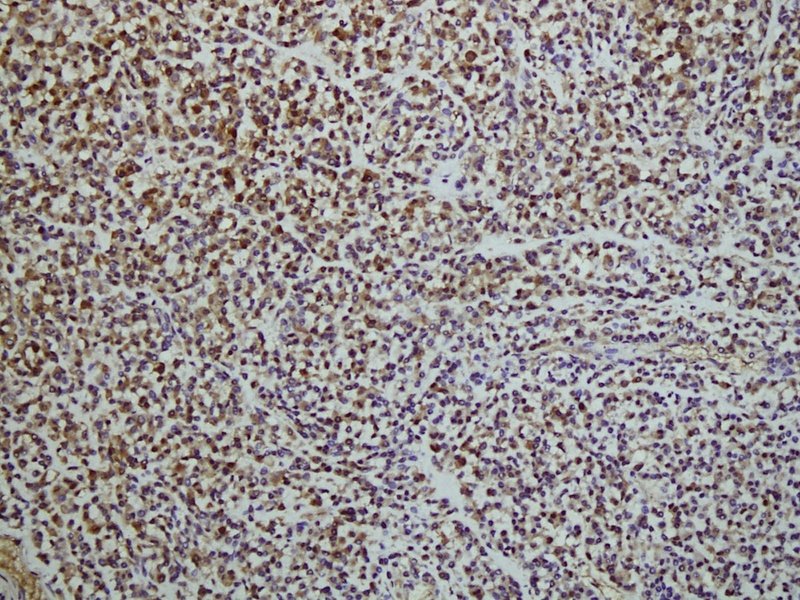 Epithelioid tumor cells are usually malignant appearing, with abundant eosinophilic cytoplasm. 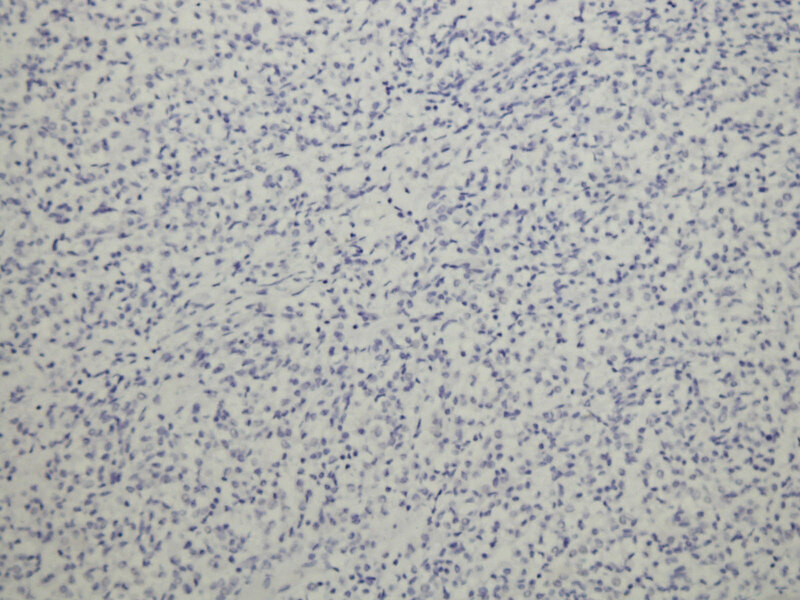 Plasmacytoid features in epithelioid GIST have been described in cytology specimens (J Cytol [serial online] 2013 [cited 2013 Apr 3];30:8, Acta Cytol 2005;49:435), and in patients with features suggestive of Carney's triad (Diagn Pathol 2011;6:52). 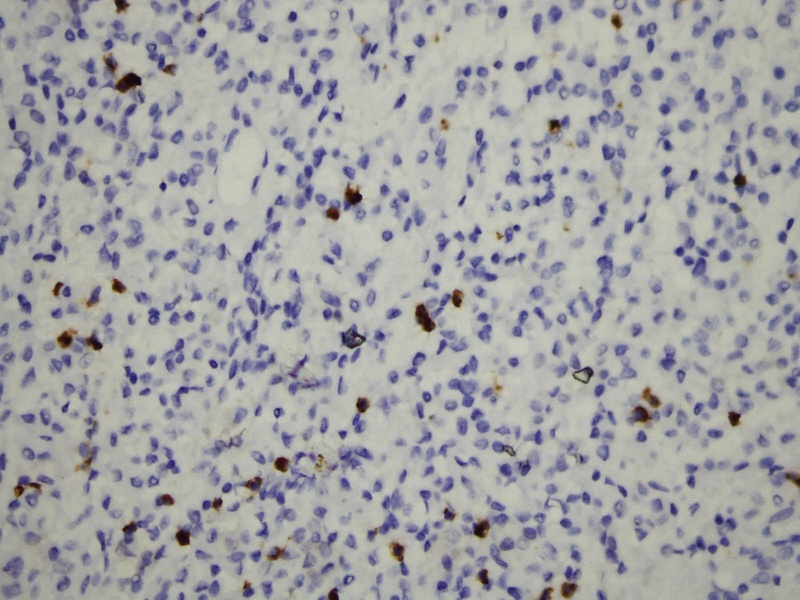 The plasmacytoid cells which were CD38+ (a plasma cell marker), may have actually been plasma cells. 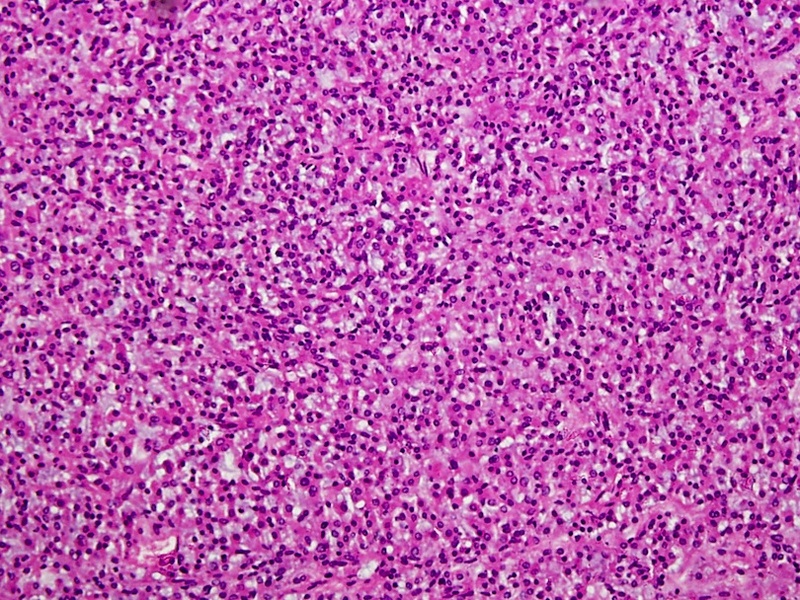 The differential diagnosis includes inflammatory fibroid polyp (spindle and stellate cells with onion skinning around blood vessels, eosinophils, lymphocytes and plasma cells; CD34+ spindle cells are KIT-, DOG1-) and lymphoid / plasma cell neoplasms (no areas resembling GIST, positive for B cell markers, CD34-, CD117-). 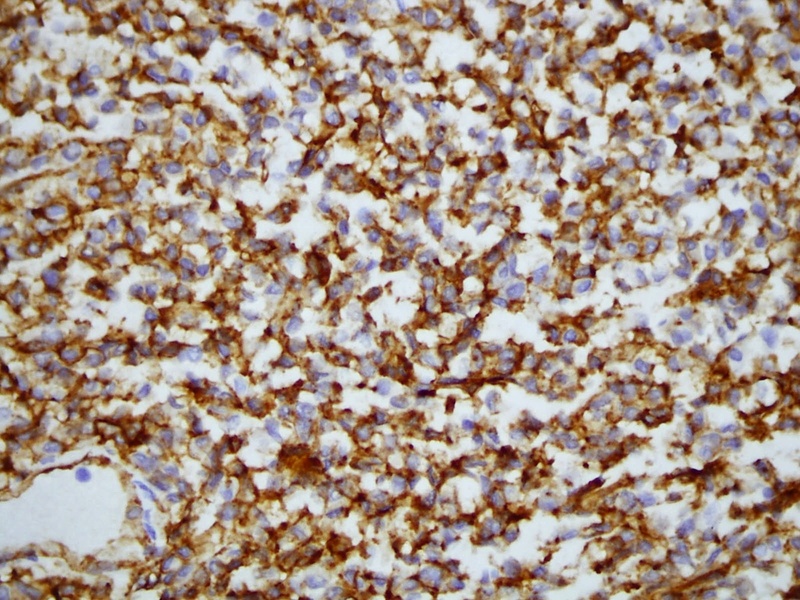 Tyrosine Kinase Inhibitor Therapy, including Gleevec (STI571) is usually effective treatment for GIST tumors (US National Cancer Institute-PDQ). Surgery is also an option in many cases. Historically the 5 year overall survival of small bowel GIST was only 50% (BMC Gastroenterol 2006 Oct 24;6:29), although recent reports show marked improvement (J Gastric Cancer 2012;12:243).